When I was living in Spain I used to walk down the narrow callejón away from my school and go to the neighborhood market for snacks. One wonderful day I discovered polvorones. Once I had them I couldn’t get enough and had to force myself not to buy them every day. Everything about them was appealing. From the blue and white wrapper with the twisted ends to the powdery texture they held even after I had crushed them firmly in my hand. I never knew what they were made of, but I loved their nutty flavor and the way they melted in my mouth. One afternoon during siesta, after weeks of denying myself my favorite sweet, I ventured to the corner market and asked the always-friendly woman who worked there where I could find the polvorones. Sadly, she told me they were only available during las navidades. Disappointed that I’d missed my chance to buy up as many as possible and too shy to ask if she knew how to make them, I walked back to my school. I always kept them at the back of my mind and even found them once again during a trip to Madrid when I ventured into a candy shop, just the kind of place to have something that’s normally only available during los navidades. They weren’t exactly the same, but close enough to make me smile. I’d nearly forgotten about polverones and even since I’ve become more culinarily inclined, it never occurred to me to try to find a recipe. Who could imagine my surprise when I made cookies recently for a cookie share without even thinking about the name, polvorones de avellanas, and noticed that they tasted remarkably like the polvorones I remembered! Of course, the polvorones I had during las navidades in Spain were more of a powder that one must crush into a dense powered mass in order to consume, rather than cookies, but I’m ecstatic at the memories that a simple flavor can recall! Ah, las navidades in Spain! The best time to find polvorones and amaretto! Now I know that polvorones consisted of avellanas! Yes, hazelnuts! I still have yet to learn how to make that perfectly powdery texture, but those cookies were a start. They were so light and crumbly on their own! As my gift to all of you, I invite you to come as close as I have recently to the joy of polvorones. Following is the recipe, unaltered by me (as is rare these days). Enjoy! Preheat oven to 325. Grease baking sheets and set aside. Spread hazelnuts in a large baking pan and toast in the oven, stirring occasionally, for 16 to 17 min or until the hulls begin to loosen and the nuts are tinged with brown. Sets the nuts aside to cool. Reset oven temp to 375. When hazelnuts are cool enough to handle, remove hulls by vigorously rubbing a handful of nuts at a time between palms or in a clean kitchen towel. Discard the bits of skin as you work. (It’s a bit difficult to remove all bits sticking to nuts, but they should be relatively free of hull.) Grind hazelnuts to a powder using a nut grinder, food processor, or blender. Place butter in a large mixing bowl and beat with an electric mixer on medium speed until light and fluffy. Add granulated sugar and continue beating until thoroughly incorporated and smooth. Beat in egg yolk and salt. Stir in the hazelnuts. Gradually beat in the flour. If the mixer motor begins to labor, stir in the last of the flour with a wooden spoon. Pull off small pieces of dough and shape into 1-inch balls. Place on baking sheets about 1 inch apart. Place in the upper third of the oven and bake for 15 to 17 minutes or until just barely brown at the edges. Remove baking sheets from the oven and let stand for 1 to 2 minutes. Using a spatula, transfer cookies to wire racks and let stand until completely cooled. 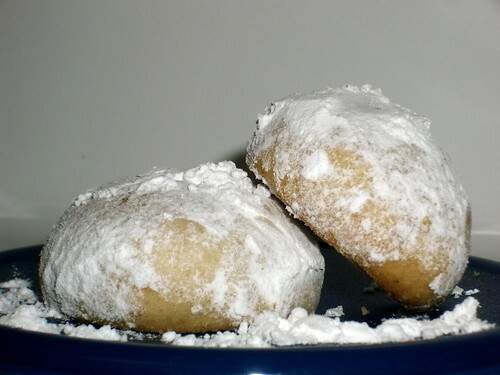 Place powdered sugar in a shallow bowl and dredge cooled cookies in sugar until coated all over. aka russian teacakes, i grew up on these around the holidays and they are my fav! Hi! It is a very good recipe. I keep it. I suggest toast the flour slightly in a pan till it takes some color . Cheers! I took your image, your link inserted im my blog.